A 52-page magazine, cover by Paul Jaquays. L.Kevin Slimak details to generate "Ikons", Paul Jaquays presents "Bionic Ducks", Aaron Arocho's two page comic entitled "Trap of the Squirm", the first "Monster Matrix" introduces "The Zokka", "The Booty Bag" is full of "The Magical Gems of Rechaun" by Ree Moorhead, Bill Seligman's "A Somewhat Unusual Quest" is more than an adventure, serals "Under Sky King's Light" by Bill Paley and "A Private Hell" by Bryan Hinnen begin, and "The Arcane Elders" by Paul Jaquays and J.Mark Hendricks continue. 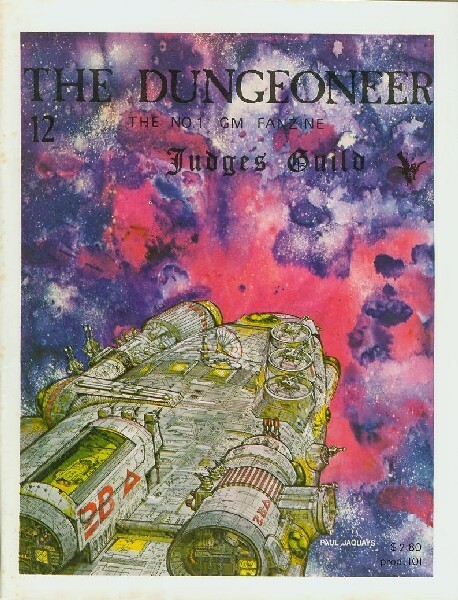 A 64-page magazine, this issue featured a cover by Paul Jaquays, showing his intrepretation of the Star Wars cantina scene. "The Arcane Elders", a fiction series by J.Mark Hendrics, ran 3.5 pages as well as "A Private Hell" by Bryan Hinnen. An article on Copyrights informed contributors of their rights by Chuck Anshell (editor). Mark Goldberg tells of his involvment in Pellic Quest in "Computer Space Gaming". The "Edge of the Galaxy", a cartoon series by Paul Jaquays continues the misadventures of "Old Gory". Marc W. Miller, the originator of Travver, talks about interstellar Empires. "Ceremonial Magic" by Paul Jaquays is a short article on same for use in role-playing. "The Valley of Black Death" is a five page strip by Aaron Arocho. "CIA Reports" by Jerry Erickson answers some of his PBM computer game questions (we haven't been able to contact him since). Monster Matrix featues three new creatures for use in the game Starships & Spacemen by FGU. "Star Ranger" is a character class designed by Paul Jaquays for Starships & Spacemen. Six pages of copy on Fantasy Role-Player character background generation. "The Fantasy Role-Playing Previous History System", is also featured by Paul Jaquays. Bob Bingham did a cartoon entitled "Space Wars". The Monster Matrix features "Snow Giants" by Paul Jaquays. 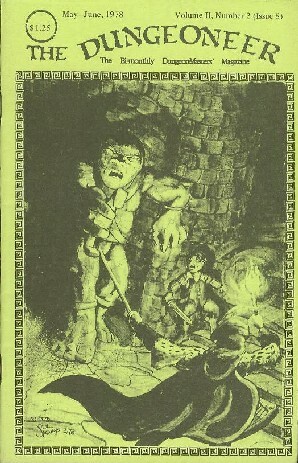 This issue also features a 15p dungeon entitled "Morkendaine" by Paul Jaquays for first and second level adventurers. 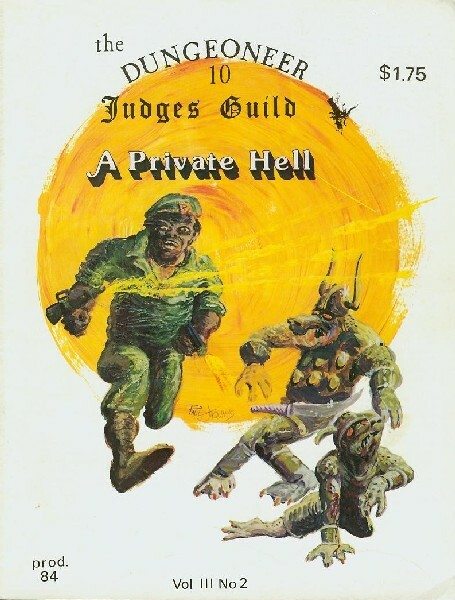 This 66-page magazine feature a cover by Paul Jaquays on "A Private Hell", a fiction series by Bryan Hinnen contained within. 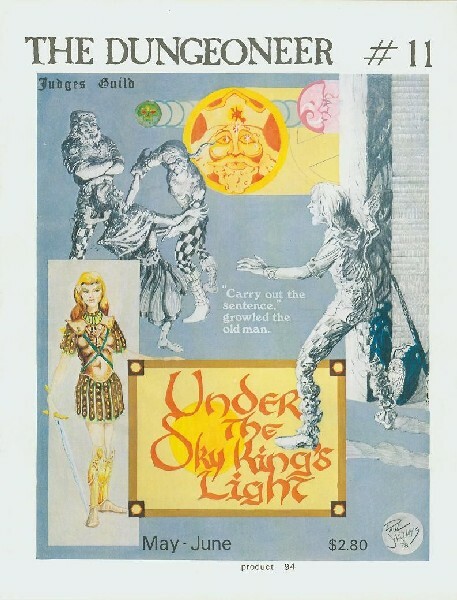 This "Arcane Elders" by J.Mark Hendricks ran seven pages of action and another fiction serial by Bill Paley entitled "Under Sky King's Light" ran for four pages. 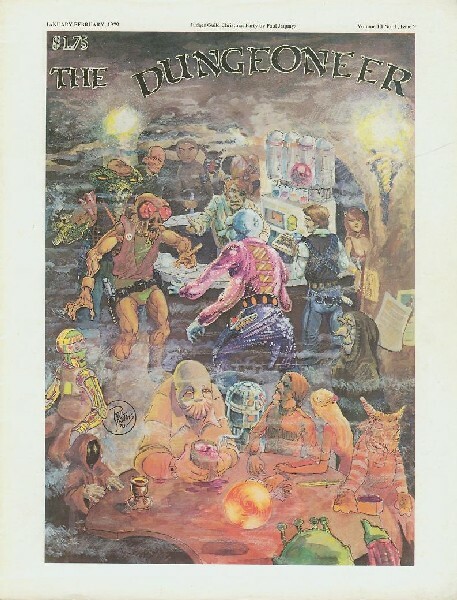 Bill Seligman continued his series on his Fantasy Role-Playing System begain in Dungeoneer No.7 by detailing his experience/skill acquisition and researching spells in an eight page article "A New and Radically Different Skills System". 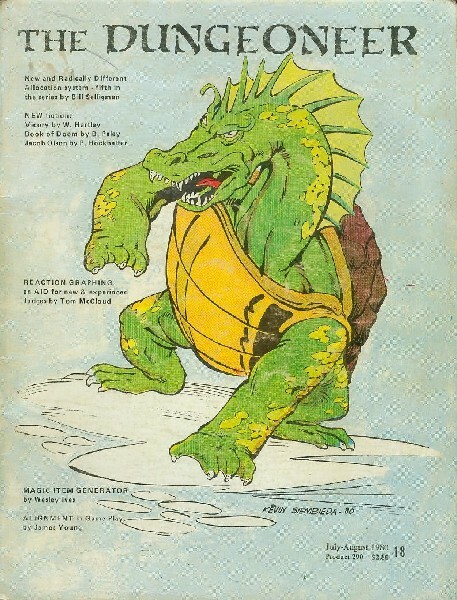 Ten monsters for D&D were featured in this issue in the "Monster Matrix". Rusty Lamont put forth much effort to provide a "Name Generator" with 997 possible names for D&Ders everywhere. "Space: The Gaming Frontier" by Bill Paley, fantasy role-playing need not be earthbound. 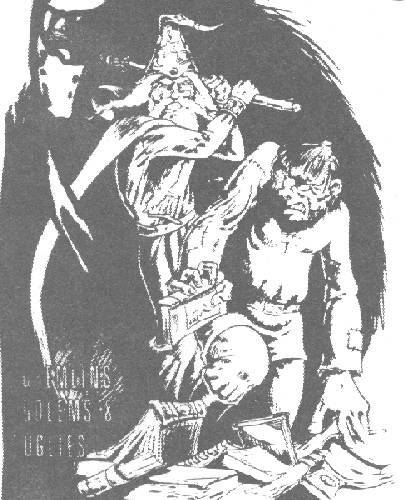 "Half-Ogres and Anti-Paladins" by Paul Nevins, adding two unusual character class types can help maintain interest in large campaigns. Looking for Judges in your area, "The Lords of Valor" list 33 with addresses from New York to California. "Effects and Uses of Poisons", an informative 3 page article by Steve Marsh. "Nose Wet or No Sweat", some "Tricks and Traps" by Bill Paley. "The Die is Cast", reviews of The Lord of the Ring - The Movie, 4th Dimension by TSR, The Apprentice, Icerigger plus a 2 page review of Runequest by Paul Jaquays. "The Boot Bag" contains three magic items by Jon-Pierre Pazevic. "Pyramid of Ra-Dok", a five page mini-dungeon by Patrick Westfall. "The Edge of the Galaxy" by Paul Jaquays, the continous saga of "Old Gory". 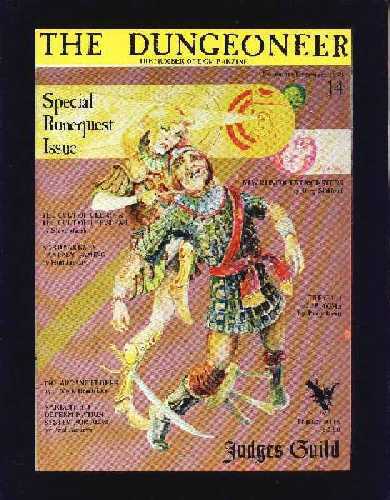 A 68-page magazine, this issue featured cover by Paul Jaquays, depicting a scene from "Under Sky King's Light" by Bill Paley, five more pages of the continous saga of Lilly, Warrior Maiden. "The Arcane Elders" by J.Mark Hendricks, Lute and Ralph continue on their journey. Paul Jaquays and Aaron Arocho join forces in "To Curse the Darkness", a start of a new cartoon series. "A Private Hell" by Bryan Hinnen continues with Chapter IV. Some "Thoughts on the Speed of a Lightning Bolt" by James Ward, can a Wizard hold his own against the Fighter? 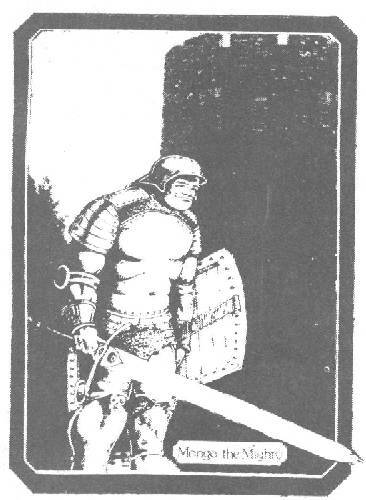 On "Creating Computer Gaming" by William Pixley, hints about computer games includes Bill's game program for "Swordsmen". "Nose Wet or No Sweat" by Tom Cooper Jr., things aren't always as they seem. "The Booty Bag", "Helms of the Planets" by Ronald Pehr. "Faith, an Alternative to Clerical Spells" by Thomas A McCloud. "The Die is Cast", Bryan Hinnen reviews Buck Rogers in the 25th Century. "The Wet Navy Meets the Space Fleet", or Mercenary-style Charts for Nautical Force Command in Traveller by Bill Paley. Monster Matrix, Scott Johnson give statistics for seven monsters. 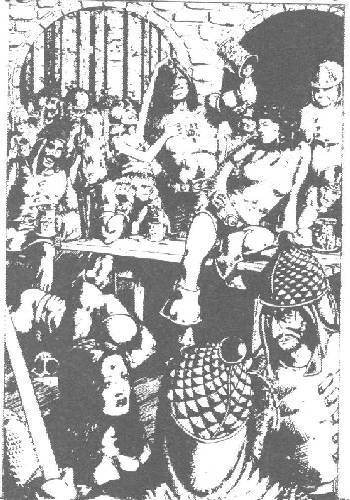 "A Quick Runequest Scenario" by Greg Stafford. "The Legend of Maramis the Elf (XIII)" by Ronald Pehr, a lovely elf-maid in search of adventures. "Wilderness" by Brya Hinnen, life outside the dungeon. "The Lost Lair" by Paul Jaquays, 6 pages with maps for The Fantasy Trip: Melee and Wizard. "The Edge of the Galaxy" Part 4 by Paul Jaquays, the cartoon saga goes on. A 64-page magazine featuring a cover by Paul Jaquays. "The Arcane Elders", a serial by J.Mark Hendricks continues. 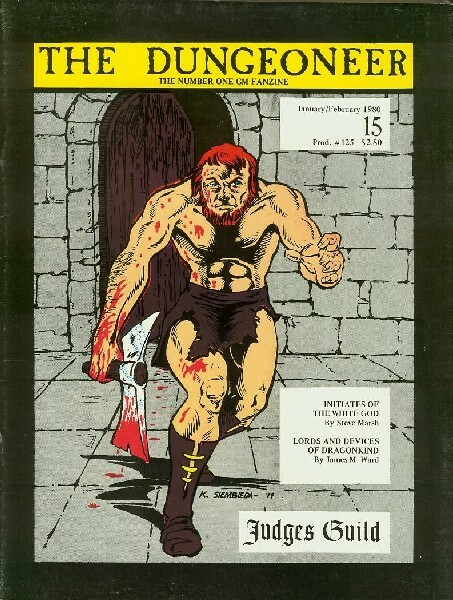 "The Temple of the Eye of Lusan" by Merle Davenport, with graphics by Paul Jaquays is this issue's specially featured adventure which can be played in three of more time periods. In Dungeon Depths, Bill Paley gives an adventure into the "Horrible Hole of Tim the Mad". Paul Jaquays supplies legends and pieces of information to help or hinder dungeon delvers on their quest into "Dark Tower". "Nose Wet or No Sweat" has Mike Kelly's "Three Dimensional Maze", Paul Jaquay's in-depth article on "Fake ColorProcess" is informative to both the novice and the experienced artist. Mercenary type charts are presented by Bill Paley to aid in producing trained characters from Airspace Command for use with Traveller. A Miniature scenario "Recon in Force Denied" by Bill Paley and Paul Jaquays. Several new monsters are in the "Monster matrix" and "Monster of the Month". A 64-page magazine, featuring a cover by Paul Jaquays. Tom Cooper Jr takes "A Closer Look at Anti-Paladins" with suggestions to clarify their unique abilities. Paul Jaquays gives a new NPC, "The Patriarch". 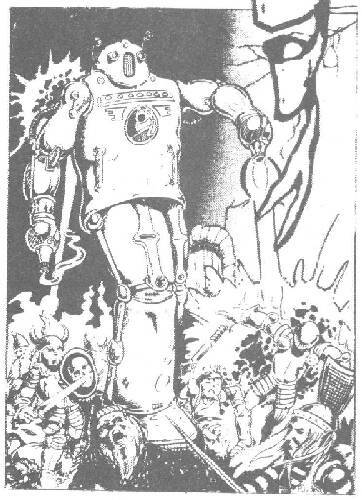 In "Swords, Sorcery and SuperHeros", Paul Jaquays converts D&D rules for use with Villians & Vigilantes. Special words and phrases to boost the power of non-intelligent magical items are given by Bill Paley. Ronald Pehr clarifies their potency and effects in "Poison Uses". Paul Jaquays handicapping scenario for V&V is "Research Station Mega Gamma". "The Arcane Elders" by J.Mark Hendricks continues, eight new monsters are introduced in "Monster Matrix, twelve weapons and charms are found in "They Booty Bag", Robert Bingham reviews Authentic Thaumaturgy, and the rules for our Third Annual Dngeon Design Contest are included. 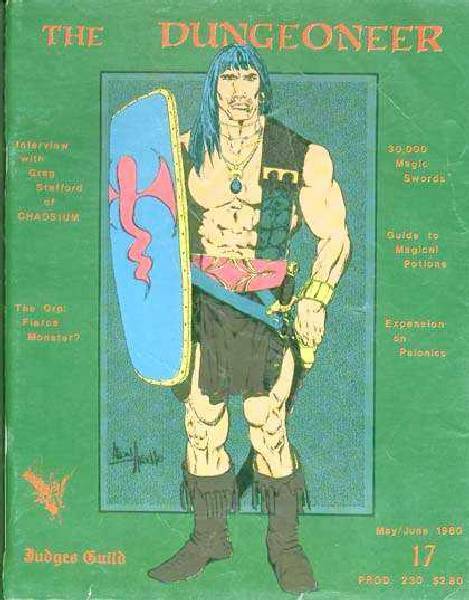 A 64-page magazine, Special Runequest issue with cover by Paul Jaquays. "The Die is Cast", Paul Jaquays reviews Snakpipe Hallow. "Aardvarks in Fantasy Gaming" by Paul Jaquays, featuring Cerebus the Battling Aardvark. 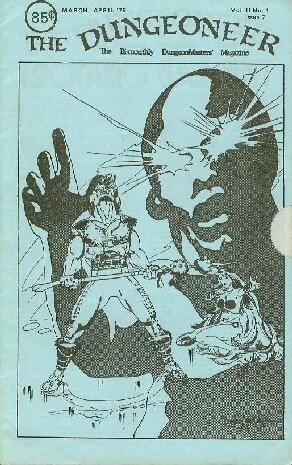 "Cult of the Spear", a subcult of Orlanth by Steve Marsh. "A Private Hell" by Bryan Hinnen continues with chater four. 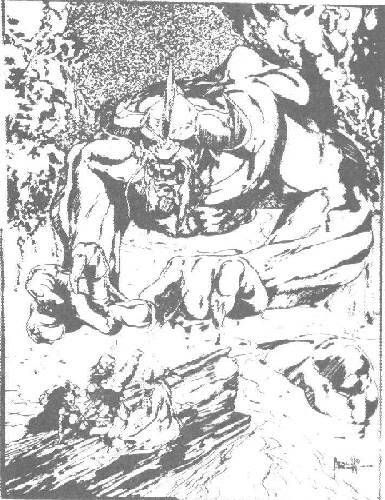 "The Cult of Magma, the Volcano God" by RUdy Fraft, a cult for Runequest. "Throwing in D&D" by Jon-Pierre Pazevic, a system for throwing objects. Steve Marsh has some interesting ideas in "Suggested Player Cult Outline". "The Queston of Amor Class" by Rusty Lamont is base on his seminar at MichiCon VIII. "Under Sky King's Light" by Bill Paley the story goes on as Lilly battles a giant skunk with obvious results. "The Cult of Uleria" by Steve Marsh, a cult based on Aphrodite. "Up-gunning Monsters? Bah Humbug" by Bill Paley, are super powerful monsters really necessary. A 64-page magazine, with cover by Kevin Siembieda and Bryan Hinnen. Steve Marsh presents a new player class in "Initiates of the White God", "The Arcane Elders" by J.Mark Hendricks continues, Scott Fordyce's letters concerning role-playing magic. Third in a series of articles concerning originality in developing characters is Bill Seligman's "New and Radically Different Combat System". 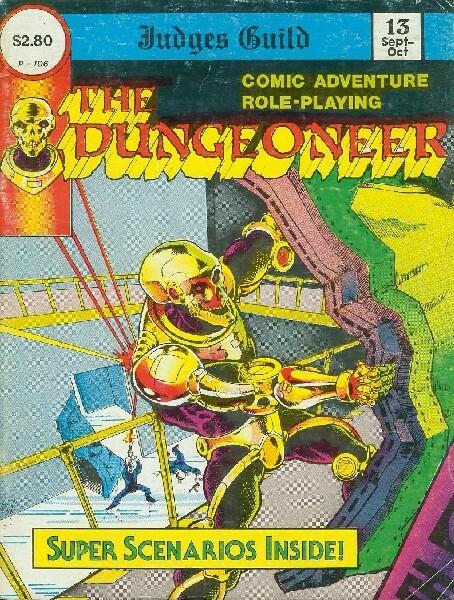 "The Booty Bag" contains "The Lords and Devices of Dragonking" by James M.Ward, "Questing", a comic strip by Aaron Arocho, "A Private Hell" by Bryan Hinnen continues, this issue's specially featured adventure for Runequest is "Tower of the Singing Doom" by Steve Marsh, "under Sky King's Light" a serial by Bill Paley has it's final chapter in this issue. A 64-page magazine, front cover by Kevin Siembieda. Bill Paley reveals what he felt to be causes of character's demise in "Player's Errors in 'Under Sky King's Light'", Jon Mattson described "The Mystic: A New Magic User Sub-Class", Bill Seligman ties the first three articles together and adds his "Ranking" experience rules in "A New and Radically Different Expertise System", Steve Marsh introduces the lawful secret cult of Thebes, rituals and benefits in "The High Priesthood of Thebes", Bill Paley gives an opportunity to make a rather nondescript class a bit more exciting in "The Other Class in Traveller", a fiction adventure "Winter Encounters" by J.Brightman and W.Sommers, Anthony D. Barnstone presents another fine candidate for the master of Evil in your campaign in "Warlocks: A New Magic User Sub-Class", Bill Paley gives a brief outline of the set-up and interaction of the six Traveller classes in his campaign in "The Armed Forces in Traveller", "The Edge of the Galaxy" a serial by Paul Jaquays continues, and this issue's specially featured adventure is "The Lair of Krepache the Leper" by Natalie Silberman, Mark Rubin, and bill paley. 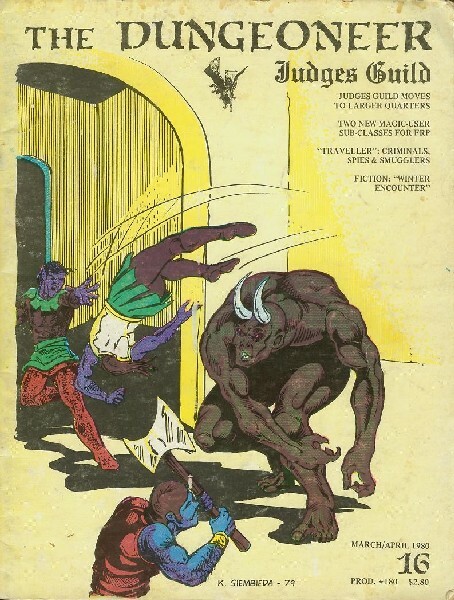 A 64-page magazine, with cover by Aaron Arocho, includes "Photo Follies", a look at the Judges Guild new quarters. "Arcane Elders" by J.Mark Hendricks continues, "The Monster Matrix" introduces eight new fearsome creatures. Mike Reagan reviews Swordquest, "Brimstone's Brew" by Dian Harian shows happenings within her world's city. Greg Stafford of Choasium is interviewed by Rudy Kraft. Ree Pruehs offers a "Potion Table". Geoffrey Tolle lists physical psionics on his chart in "An Expansion of Psionics". Paul Britt Garcia gives us a seven page matrix of Swords in "30,000 Magic Swords". Glenn Kuring feels Magic Users should age, and shows how to determine this in "Aging in D&D". E.Al Hattlestad Jr. gives a chart for determination of dungeons in "Solo Matrix". David Dougher talks about "Computerized D&D". Jon Mattson has some "Additional Thoughts on Mystics", and "The Booty Bag" is full. A 64-page magazine, featuring a cover by Kevin Siembieda. 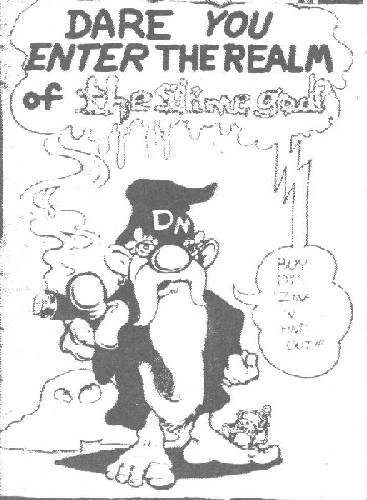 Tom McCloud relates his experiences with the "Leprechaun Rosary" and gives charts for it's effects, and in "Reaction Graphing" he presents a graph for good, evil, or neutral monster reactions. Mike Kelly offers three pages of "Elven Names and Meanings From the Silmarillion". "A New Allocation System" is the fifth in a series of articles. "The Monster Matrix" presents four more new monsters. A mini-dungeon, "The Oldcastle Inn" by Mark Watson, thirteen new magic nymphs are in Steve Marsh's "Nymphs". "The Booty Bag" holds seven new charms and weapons, and a new character "Vampire" is introduced by Jim Webster.